Rapid biodiversity assessment of myxomycetes in two regions of Kenya. 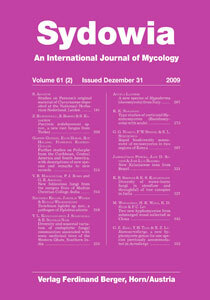 Ndiritu G. G., Spiegel F. W. & Stephenson S. L. (2009) Rapid biodiversity assessment of myxomycetes in two regions of Kenya. A rapid biodiversity assessment using the moist chamber culture method was carried out to determine the assemblages of myxomycetes associated with four microhabitats in two regions of Kenya. The assessment yielded a total of 60 species, of which 51 and four were new records for Kenya and Africa, respectively. Overall, 70 myxomycetes are now known from Kenya. Myxomycetes were relatively more diverse in the arid Kajiado District than in the wetter Aberdare Mountains. Species abundances and diversities of the four microhabitats were comparable in Kajiado. However, in Aberdare, the aerial litter and aerial bark microhabitats were more species-rich than the ground litter and ground bark microhabitats. Distribution of species in relation to land use/cover displayed an interesting pattern. High species diversities were recorded for montane forests, alpine zones, agricultural lands and arid lands, but diversities were moderate for seasonal forests and plantation forests. Minimal relationships existed between species richness and both elevation and pH for most microhabitats; however, significant relationships were found to exist between species abundances of aerial litter and elevation in Aberdare, and between ground bark microhabitats and pH in Kajiado. Lastly, a significant percentage of the species recorded (63 %) are frequent in the tropics while the rest are either occasional or rare. Keywords: Slime molds, ecology, distribution, microhabitats, sampling effort, Eastern Africa.